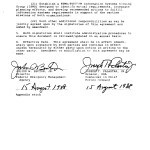 Multiple agreements signed by FEMA and the Department of Defense as well as U.S. Army Forces Command in 1987 and 1988. The agreements concern the roles of FEMA and the U.S. military during emergencies and civil disturbances. This guide offers recommendations for local outreach campaigns, explains how to effectively develop and disseminate messages in order to help the public better understand their role in reporting suspicious activity, and helps law enforcement agencies and community partners to understand, navigate, and use the many resources available to help build and sustain local efforts. New technologies, resources, and innovative practices highlighted within this document can be used to improve the education, communication, and trust amongst communities and law enforcement agencies who serve them. With the proper tools and knowledge, individuals and entire communities will help law enforcement agencies identify, investigate, and prevent crime and terrorism. DHS National Protection and Programs Directorate Protective Security Advisors and Special Event Domestic Incident Tracker Overview presented at the FEMA National Preparedness Symposium on August 8, 2012. On Monday, May 16, 2011, thousands of players across the United States received notification of a simulated catastrophic earthquake in the New Madrid Seismic Zone (NMSZ), officially kicking off the National Level Exercise 2011 (NLE 11) functional exercise. From May 16–19, 2011, Federal, state, regional, local, international, nongovernmental, and private sector partners participated in the exercise, the capstone event of a White House-directed, congressionally mandated cycle of planning and preparedness events. Notably, exercise activities were carefully balanced with ongoing efforts to respond to and recover from real-world flooding and tornado-related disasters in the Southern and Central United States. Although some partners, including the four states in FEMA Region IV (Alabama, Kentucky, Mississippi, and Tennessee), had to reduce their participation in NLE 11 due to these events, their actions, requests, and decisions were simulated to allow for robust and realistic exercise play. Simultaneously conducting NLE 11 and managing real-world disasters resulted in a realistic “worst-case scenario.” Consequently, players were able to test the Nation’s ability to respond to several devastating events, strengthening the country’s preparedness through their efforts. The Federal Emergency Management Agency’s (FEMA) Individual and Community Preparedness Division partnered with the International Association of Chiefs of Police (IACP) on a project to research and develop a strategy to improve the public’s awareness and reporting of suspicious activity. In early 2010, IACP conducted research of contemporary and historical practices intended to improve the public’s reporting of suspicious activity. The literature review showed that little research existed on the motivations and barriers that affect whether or not individuals report information to law enforcement. To close this gap in data, IACP developed a three phase primary research strategy. This report provides an overview of key research findings and provides insights and recommendations that support national and local campaigns. National Level Exercise (NLE) 2012 Overview for Northeast Disaster Recovery Information X-Change (NEDRIX) from March 14, 2012. This document is intended to provide private sector stakeholders with an overview of NLE 2012, to include a discussion of the exercise timeline, a snapshot of the exercise scenario, and a review of the various potential exercise participation opportunities. A contract solicitation posted to the Federal Business Opportunities website between February 10 – 24, 2012 concerning the construction of a temporary camp anywhere in the continental United States (CONUS) within 72 hours in a disaster-impacted area or “any other situation where FEMA or an agency working through FEMA needs a RSC” to host up to 2,000 responders and emergency staff as well as displaced citizens. FOUO FEMA National Level Exercise 2011 Overview Presentation from January 12, 2011. Focus: Domestic, non-terrorism; Major Earthquake (specific focus on a catastrophic earthquake in the New Madrid Seismic Zone (NMSZ)) the exercise concept was created in 2006 as a follow-on task to the Federal Emergency Manage Agency (FEMA) NMSZ Catastrophic Planning Initiative. NLE 11 will be a Functional Exercise (FE) that will last approximately four days with a specific focus on the first 72 hours. This exercise is designed to provide FEMA with a crucible to test Administrator Fugate’s mission for the Federal government to make decisions and take action within the first 72 hours of a major disaster that will have positive effect on life saving and life sustaining activities. In the event of a catastrophic incident or threat to the National Capital Region (NCR), the significant federal presence would both necessitate and complicate a robust response. In order to facilitate the coordination that would be required for the integration of federal, state, and local response efforts, the Office of Personnel Management (OPM) and the FEMA Office of National Capital Region Coordination (NCRC) have compiled this draft NCR Federal Concept Plan (CONPLAN) of Catastrophic Planning Assumptions. For planning purposes, a catastrophic incident is defined in the National Response Framework as any natural or manmade incident, including terrorism, which results in an extraordinary level of mass casualties, damage, or disruption severely affecting the population, infrastructure, environment, economy, national morale, and/or government functions. The purpose of this ―battle book is to provide the FEMA Director with background information and recommended checklist actions on scenarios that may require a significant response operation under the National Response Plan. This document is intended to serve as a ―one stop reference that includes information on the agency’s emergency teams and resources. The United States (U.S.) Government, along with other nations, international organizations, and nongovernmental organizations, rushed to provide critical life-saving and other assistance to Haiti. President Barack Obama directed the U.S. Agency for International Development (USAID) to lead the coordination of the U.S. Government assistance to Haiti. USAID worked with other Federal agencies to organize and deliver assistance to the victims of the earthquake. The Department of Homeland Security (DHS) deployed over 1,000 personnel from various components to support U.S. assistance in Haiti. As of April 2, 2010, the U.S. Government had provided over $1 billion in assistance to Haiti. In accordance with Title IV of Public Law (PL) 110-53, “Implementing Recommendations of the 9/11 Commission Act of 2007,” the Administrator of the Federal Emergency Management Agency (FEMA) defined Federal and Mutual Aid Emergency Response Officials (F/EROs) as personnel with responsibilities under the National Response Framework (NRF), National Infrastructure Protection Plan (NIPP), the National Continuity Policy Implementation Plan (NCPIP), and / or the National Incident Management System (NIMS). Additionally, Title IV requires the establishment of an inventory or database system of F/EROs. Oregon 2010 Homeland Security Grant Program Investment Justification, April 29, 2010. When a Disaster is declared, FEMA employees and Contracted Inspectors will be working in the affected area. In order to help you identify authorized FEMA staff and Contracted Inspectors, we are providing samples of authorized FEMA Identification Credentials. If there is any question regarding the authenticity of someone claiming to be a FEMA employee, inspector or representative, please contact us as soon as possible. FEMA Composite Enterprise Architecture Overview “The Direction of FEMA’s EA”, June 8, 2009. FEMA Exercise Modeling & Simulation Briefing from the National Exercise Simulation Center (NESC), March 4, 2010. FEMA 2009 Presidential Inaugural NSSE Brief, January 14, 2010. Beginning with FY2010 National Level Exercise (NLE) to engage the National Planning Scenario 1-Improvised Nuclear Detonation, the Training Working Group (TWG) has become an integral part of preexercise preparedness. To assist with the exercise preparedness activities, the Training Manual (TM) has been created to attempt to identify training for all levels of response and recovery. The training offered by exercise participants will be captured and indexed in this manual. To accomplish this task, significant participation was necessary from participating Emergency Support Functions (ESF) to build the index and the training aides found in this manual. The State of Connecticut has identified interoperable communications as a priority in its emergency response and disaster recovery planning efforts. The Connecticut Public Safety State Executive Interoperability Committee (CPSSEIC) is comprised of emergency management and communications experts from throughout the state. CPSSEIC meets regularly to determine communication equipment requirements, provide grants guidance, and develop training and exercise requirements. This Comprehensive Preparedness Guide, CPG 101, continues the more -than – 50 -year effort to provide guidance about emergency operations planning to State, Local, Territorial, and Tribal Governments. Some predecessor material can be traced back to the 1960s-era Federal Civil Defense Guide. Long-time emergency management practitioners will also recognize the influence of Civil Preparedness Guide 1-8, Guide for the Development of State and Local Emergency Operations Plans, and State and Local Guide (SLG) 101, Guide for All-Hazards Emergency Operations Planning, in this document. The Target Capabilities List (TCL) Implementation Project is the method by which the Federal Emergency Management Agency (FEMA) will update the TCL and implement the doctrine of capabilities-based preparedness as outlined in the National Preparedness Guidelines. The goal of the project is to provide more user-friendly, accessible, and credible capability targets with which to link all preparedness cycle activities to strengthen preparedness across prevention, protection, response, and hazard mitigation capabilities. The purpose of this document is twofold. First, it explains the history of the TCL and why FEMA is leading the effort to streamline and revise the content found in TCL Version 2.0 through the establishment of updated Target Capabilities.